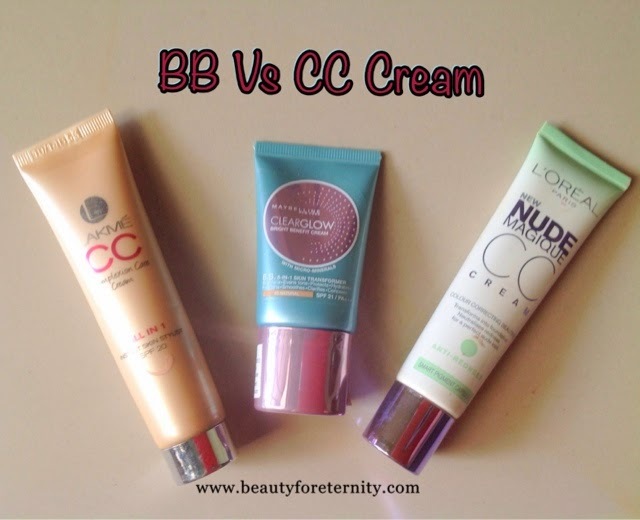 BFE Reader Query 003- BB Cream Vs CC Cream | Which One To Choose ? In this post, which is 3rd in our newly started series of BFE Reader queries, I am going to talk about BB and CC creams. The other day, a reader asked me whether she should buy a BB cream or a CC cream and a lot many questions regarding these creams. So let's begin to know about BB creams and CC creams. Question : BB cream Vs CC cream ? Which one should I choose ? BB stands for Beauty Balm/Blemish balm and CC stands for Colour Correction. BB cream is nothing but just diluted foundation which spreads easily and feels light on skin. It should not be misunderstood as a skincare product because the word beauty balm is just a misnomer. I would call it a hybrid between a moisturiser and a foundation. Some BB and CC creams come with serum, face primer, sunscreen also along with moisturiser and foundation. What does a BB Cream and a CC Cream do ? BB cream being a light-weight foundation glides easily on the skin and conceals some flaws like spots and marks. It moisturises also but one should not skip the moisturiser even if using a BB cream because your skin needs way more moisture than a BB cream alone can offer. CC cream does all that a BB cream does plus it also corrects redness and any other skin discolouration. BB and CC creams can replace your face primer and foundation and sometimes sunscreen also but that just depends how much SPF does your BB/CC cream has to offer. Is there any other difference in BB creams and CC Creams ? As far as I have experienced by using both BB and CC creams, I would say that BB creams give a dewy finish and CC creams are more on mattifying side. CC creams are lighter than BB creams. Some brands add age-defying ingredients also in the CC creams. You can buy either of the two i.e. BB or CC cream depending on the need of your skin. For example if you want to conceal some dark spots and under eye dark circles on your face and want a natural finish then you should buy BB cream. And if you have redness on your face or you want to conceal purple or blue-ish/greenish veins then you can opt for a CC cream. Do I need to use foundation over a BB cream? As already said above, a BB cream is a diluted foundation in itself and gives light to medium coverage. However if you want more coverage then go for a concealer and use it only where it is required rather than layering a foundation all over your face. What to expect from a BB cream ? You should expect a BB cream to even out your skin and conceal some flaws by giving you a natural finish. Never expect a BB cream to give you full coverage or airbrushed finish and deal all your skin issues like spot correction, fine lines, wrinkles, pores etc. You can't afford to miss your daily skin care regimen if you replace your foundation with a BB or CC cream. What to expect from a CC cream ? All that a BB cream does plus colour correction. It will cancel out redness and any other discolouration that you may have on your skin. Do I need to apply moisturiser underneath a BB / CC cream ? Although a BB/CC cream is a blend of a moisturiser and a foundation yet it is insufficient to provide adequate amount of moisture to your skin. A moisturiser is a must underneath a BB or CC cream. People with oily skin can always go for oil free water based moisturisers. Skipping a moisturiser might keep you matt for a longer time but it is not advisable for your skin on a long run. Do I need to use sunscreen ? If your BB cream has insufficient SPF which is less than 30 then Yes, you must use a sunscreen separately to ensure protection from the sun. Is it a skin care product ? BB or CC creams are nothing but a marketing tactic. These are cosmetics and not skincare products. You need to have a dedicated skin care routine in order to have a problem free skin. BB and CC creams alone can not be relied upon no matter what the companies claim. When should I prefer BB cream/ CC cream over foundation ? - in summers because these feel much lighter than foundation. - when you want your makeup to cover your flaws and address some minors skin issues at the same time. I hope this post regarding BB and CC creams solves all your queries. Feel free to comment if you need to ask anything else.